I just got this one in the mail on Monday, the front is a little distracting with the fold, but the back is quite pleasing. Post a new note if you have one! I haven't bought a note in 5 weeks now. I hope to remedy that next week at the ANA! Here is the last note added to my collection. That note is way cool Boiler! I've been looking to get a woodchopper, but mine will likely end up being a well circulated series 1907 US note rather than a Treasury note. Did all the serial numbers end in stars, or did they have the same meaning then as they do now? Hi Jeff. How are things up your way? I am a newbie when it comes to currency but I believe that all the Rainbow notes are star notes at least everyone that I've seen is. I didn't know you did currency. I've picked up a few neat notes in the last 4-5 months. Maybe someday I can arrange to show them to you. Things are good here, though it's getting hot again (nice two-day reprieve for the weekend though!). I am not much of a currency collector either, with me it's more for type, and mostly circulated. It seems I go in fits and starts, a few years ago I bought a bunch of large FRNs, then nothing, then lately I started with a 1901 bison, then a couple gold certs and the $5 FRN, so we'll see when I get bored again. My Saint set is nearing the limits of my budget, so currency is a nice diversion. I used to and still do save new notes, mostly $1 bills, buy 10 or so unc consecutive notes from the bank and put them away. Been doing that since series 1981A, so I've got a lot of those. But lately the interest has been in large size notes. Still need a lot of types, like the Onepapa, the educational series, the $100 1914 FRN, which is a dream just like the 1918 battleship $2 FRN. And I haven't even touched the nationals! Oh well, there are still a lot of neat ones to get, and many are more affordable than branch mint Saints from the 1920s. I picked these two up last week and they arrived today! My first two large size nationals. Boiler, your paper money is almost as cool as your coins! I love that old legal tender Boiler! Well, I got these two in the mail today, nothing special, but at least they were cheap! But then I also got this today, finally a note I'm not embarrassed to show in the same thread as Boilers! I sent this one in to PMG with a coupon for a free submission I won on the numismaquest, and I called in to check on it today and found out it's on its way home, graded 64 EPQ, which I think it pretty darn good! Very nice! What is EPQ? I think it means exceptional paper quality, though I don't recall for certain. I had never heard of it myself. I heard PPQ (Premium Paper Quality), but not EPQ. I think it's basically the same thing, PCGS uses PPQ, and PMG uses EPQ, sort of like the difference between DCAM and UCAM. Not very old, but very nice peices. Sorry, don't know how to add more than one attachment. I like the fractionals, Here's the newest. 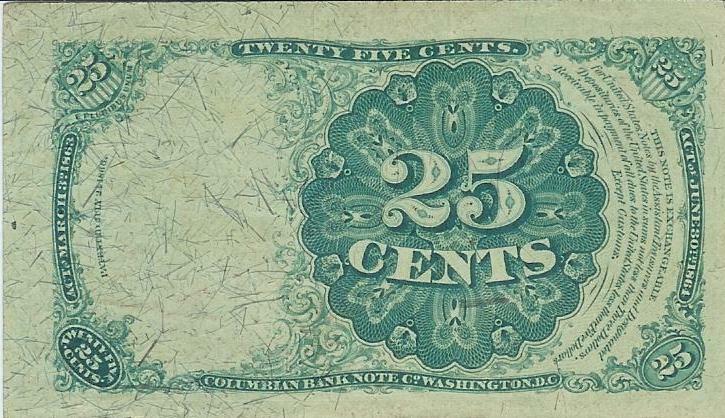 1874 fifth issue 25 cent. 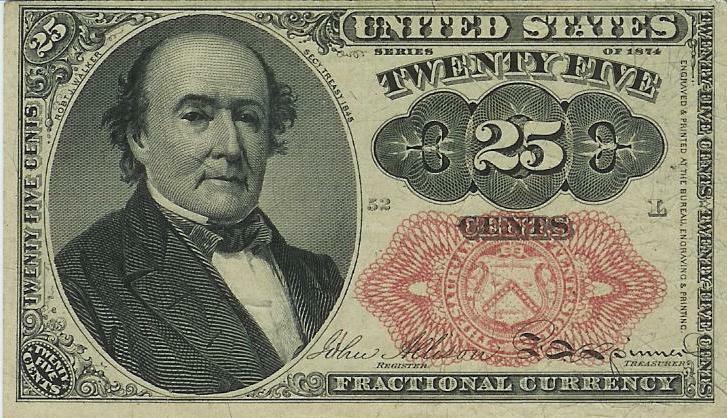 Very cool fractional note! In my opinion they are quite underrated at the moment. Thank you, I really like the fractionals. I am also getting into the Military Payment Certificates (just haven't picked any up yet). I picked this 1896 silver $1 ed note at one of my local coin shops that I frequent! Bought it raw as VG and I am happy with it!